This four-layer lemon torte recipe looks decadent, but the lemon adds a certain lightness that cuts through the richness. It's a terrific dessert welcome in spring or for a joyful bridal or wedding luncheon. Such a pretty dessert deserves your finest footed cake plate and dome. Plus guests can't get enough of this showstopper. Whisk together 1 cup sugar, 3/4 cup lemon juice, 3 eggs, and 3 egg yolks in a medium heatproof bowl (preferably not metal because the acid in the lemon juice reacts with the metal and gives a metallic taste to the curd). Set bowl over (not in) a saucepan of simmering water. Whisk constantly until thickened and instant-read thermometer registers 160 degrees, about 10 minutes. Remove bowl from over water. Add butter, and whisk until melted. Transfer to a bowl, and place plastic wrap directly onto surface of lemon curd to avoid the formation of a skin. Chill overnight. Place the rack in the center of the oven and heat to 375 F. Line two (9-inch) round cake pans with parchment paper. Do not grease the pans or parchment. In a large bowl, beat egg 6 egg yolks and 7 tablespoons sugar until mixture is very thick and forms ribbons when beaters are lifted. In a separate clean and dry bowl, whip the 6 egg whites until soft peaks form. Add remaining 7 tablespoons sugar, 1 tablespoon at a time, beating until stiff and glossy. Fold half the whites into the yolk mixture then sift half of the flour and 1/4 teaspoon salt over, and gently fold in until incorporated. Fold in remaining whites then sift remaining flour over the top, and fold in just until combined, being careful not to deflate the batter. Divide the batter between the pans, smoothing tops. Bake until toothpick tests clean, about 15 minutes. Cool completely in pans on wire racks. When completely cool, run a knife around the edge of the pans to loosen the cakes. Invert onto 9-inch cardboard cake circles. Cut each cake in half horizontally, and peel off the parchment paper. Place 1/2 cup sugar into a nonmetallic, heatproof bowl. Add 1/2 cup boiling water, and stir to dissolve the sugar. Stir in the lemon juice, and set aside to cool completely. In a small bowl, combine lemon juice and 1 cup cold water. Sprinkle gelatin on top, and let sit until softened, 2 minutes. Fill a medium bowl with ice water. In a small saucepan, combine gelatin mixture, sugar, and pinch of salt over medium heat, and stir until gelatin and sugar dissolve, about 4 minutes. Pour gelatin mixture back into small bowl, and set bowl in ice bath. Stir until mixture reaches room temperature, about 1 minute. In a large bowl, whisk cream and zest until soft peaks form. Pour cooled gelatin mixture into whipped cream, and whisk until soft peaks return. Refrigerate until ready to assemble the cake. In a large bowl using an electric mixer on high speed, beat the cream cheese and butter until light and fluffy. Gradually add confectioners' sugar, beating on low speed until blended. Scrape down bowl with a spatula. Add vanilla or lemon extract, and beat on high speed for 1 to 2 minutes or until fluffy. If too thick, thin with a little milk. Cover, and refrigerate for 30 to 45 minutes or until firm enough to spread. Place 1 cake layer, flat side up, on a pretty cake plate. Brush with 1/4 of the simple syrup. Spread 1/4 cup lemon curd over then 1 cup lemon mousse. Top with second cake layer, brush with 1/4 of the syrup, and spread with 1/4 cup of the lemon curd and 1 cup lemon mousse. Repeat with third cake layer, syrup, curd, and mousse. Top with fourth cake layer and brush with remaining syrup, remaining lemon curd and remaining mousse. Refrigerate 1 hour before frosting. When cake is stable, frost sides of cake with cream-cheese frosting, leaving about 2 cups to pipe decoratively on the top of the cake. 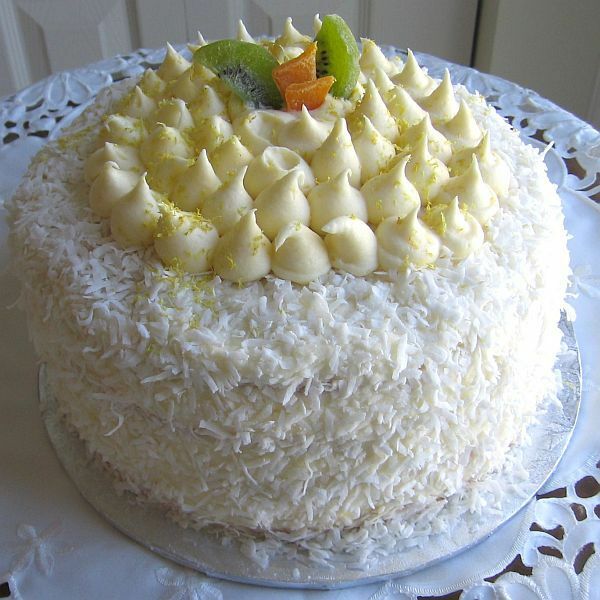 Press sweetened, flaked coconut into sides of cake, if desired. Garnish with dried fruit, if desired. Refrigerate until ready to slice and serve. This torte slices best if slightly frozen. But let pieces of cake come to room temperature before serving. The lemon curd must be refrigerated at least 12 hours before using, so plan accordingly. If you want to take some shortcuts, you can use canned lemon pie filling or jarred lemon curd instead of making it from scratch as well as instant lemon pudding mix lightened with whipped cream for the mousse, but it tastes oh so much better when you make it yourself.